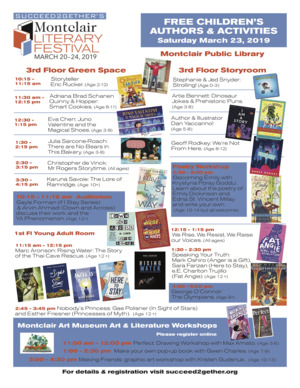 A full day of FREE children's/YA storytelling and activities at the Montclair Public Library, as part of Succeed2gether's Montclair Literary Festival 2019. Children's authors include Artie Bennett, Julia Sarcone-Roach, Eva Chen, Dan Yaccarino and Christopher de Vinck. YA authors include George O'Connor, Marc Aronson, Gayle Forman, Gae Polisner, Mark Oshiro, e.E. Charlton-Trujillo and Sara Farizan. There will also be a YA book signing room where fans can meet their author heroes. All events are free, no registration required. See the website for more details.